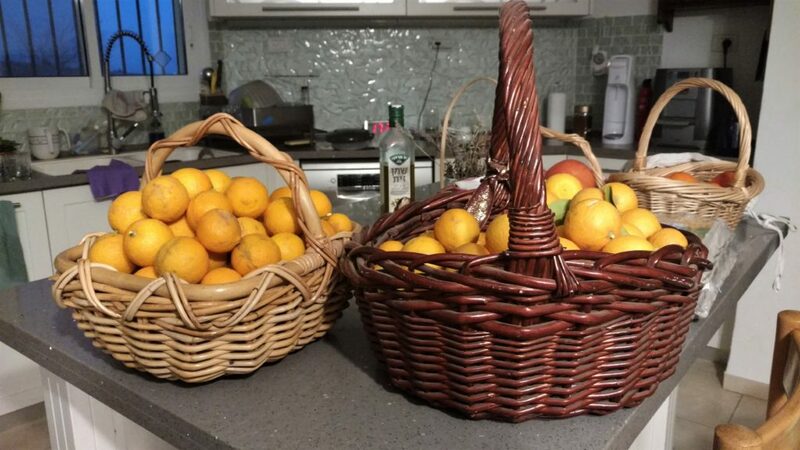 We have a lemon tree in our front yard whose fruits ripen throughout the winter season, and this week we picked two large baskets full. We’ve had a very rainy winter in Israel, and though storms have caused dangerous flooding in some areas, it’s mostly been a great blessing for the water supply, and for vegetables and fruit trees like ours. It’s a special feeling to harvest produce from the Land of Israel and to take the tithes from them, Terumot and Ma’aserot, acknowledging them and sharing them as gifts from HaShem. 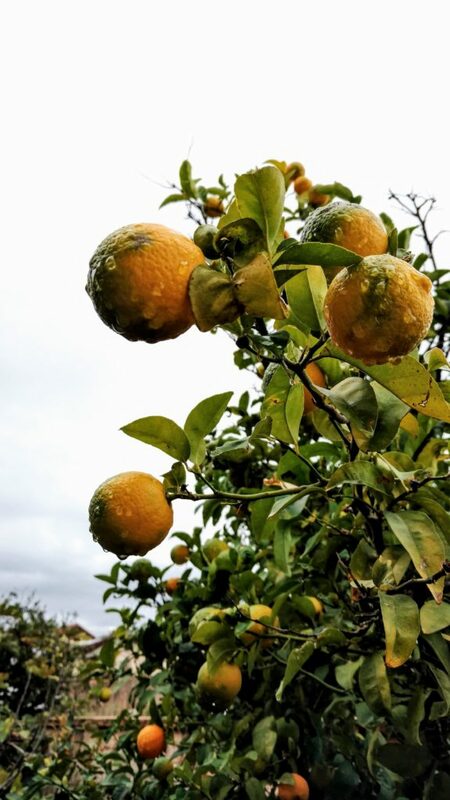 Picking lemons has its challenge – the fruits are protected by long, sharp thorns on the branches, so you have to maneuver carefully and even so you tend to get scratched up. But it’s worth the discomfort – the lemons are juicy and delicious, tart and even a bit sweet. The people complained to Moshe saying “what will we drink?” He cried to HaShem, and He instructed him about a tree, and he threw it into the water and the water was sweetened. There He set for him rule and law and there He tested them. In the midrashim the Rabbis offer suggestions about which tree it was that HaShem taught Moshe to use. In the Mekhilta, Rabbi Eleazar HaModa’i says “it was the olive tree – there is nothing more bitter than the olive.” In Pesikta Zutarta Rabbi Yehoshua ben Karcha says “this was the ivy, which is extremely bitter.” Both Rabbis agree that the tree used to sweeten the bitter water was itself bitter. Rabban Shimon ben Gamliel concludes “come and see how wondrous are the ways of the Holy One, blessed be He, compared to flesh and blood. Flesh and blood mortals use the sweet to heal the bitter, but the Holy One, blessed be He, with the bitter heals the bitter.” Rabbi Shimon bar Yochai notes that the verse says, not that HaShem showed Moshe a tree, but that He instructed Moshe about a tree, and he comments: “He taught him a principle of Torah (Pesikta Zutarta, Beshallah 15:25). The point these Rabbis are making is that the first lesson Am Yisrael learns as they begin their journey through the wilderness is the inner principle of Torah: to sweeten bitter with bitter. The Torah teaches us the path of moral and spiritual discipline. Discipline and self-control may seem bitter at first, but once mastered, bring true sweetness, giving us the resources to handle the sometimes bitter challenges of life. Unprincipled, self-indulgent behavior might seem sweet and easy at the start, but bitter tears will flow in the end. We approach the complexities and demands of life with Torah law, Halakhah, the divinely revealed inner law of life, a complex but effective framework to be ramified and applied with wisdom, with responsibility, with humility. He disciplined them with the rules of the wilderness: to bear hunger and thirst, to call in need to HaShem but not to complain. And laws that they should live by: to love one’s neighbor, to conduct oneself according to the counsel of the elders, to conduct themselves with modesty in their tents regarding family life, to conduct themselves peacefully with those who come to their camp to sell merchandise, and moral strictures so as not to be like marauding gangs that commit every kind of atrocity without shame. These rules and laws are the first stage in the transformation of the House of Israel into a nation that lives by mutual loving support, justice, compassion and truth in an otherwise immoral region. These rules and laws were taught before the Torah was given at Sinai and they serve as introduction to the spirit and substance of Torah Law. The commentators note that they are reaffirmed as commandments at Sinai. We also find this principle of bitter turning sweet in Tu BeShvat, the day that marks the beginning of the year for tithing fruits of the trees. In the depth of winter comes the first stirrings of the sap, deep within the roots, that will eventually produce sweet fruits. I so share your enthusiasm about harvesting your own fruit from the trees we own in the land. And also the sheer pleasure of taking trumot and maasrot . I feel such a powerful connection to all the generations before us doing the same mitzva, repeating the same bracha. What an honor to be able to do it.